I baked Apple and Cinnamon muffins - they were gone in a jiffy so I dont actually have any pics of it (but will make another batch when I get home and post up the recipe then). But more to the point, I made ALOT of tartlettes! 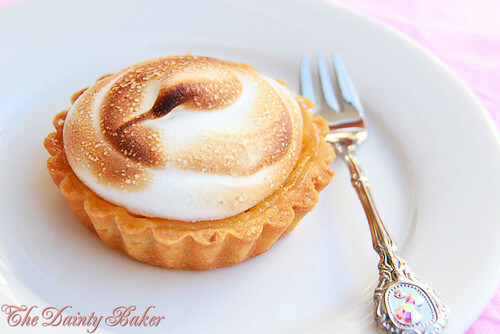 Here is one of the tarts I made, its based off one of my favourites - Lemon Meringue Pie. A few years ago I started making this dessert in little tart shells simply because I hated having to line a massive tart shell and it was easier to share this way as you didnt need to cut it up into pieces or give away your entire tart pan with it, it was just easier like this. Having been away from home for so long I rummaged through my pantry to see what I could whip up... and lo and behold! 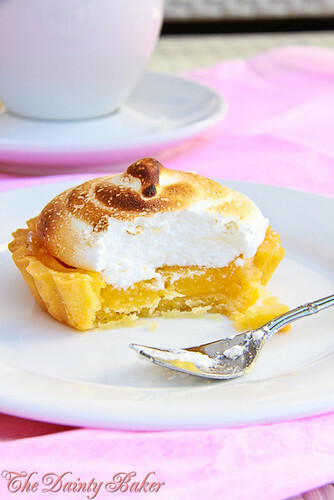 I found a can of sliced mangoes... hence my 'Mango & Lemon Meringue tartlettes'. I used a simple Pâte Sucrée recipe for the base. Grease and line all the tart shells with the pâte sucrée, make sure that it doesnt get warm ie keep it in the fridge until ready to use. To make the filling, puree the mango then put into a pot with all the other ingredients except the egg yolks and corn starch. Let the mango mixture come to a boil and simmer until it reduces and starts to thicken. Strain and return back into the pot. Meanwhile, mix the yolks and cornstarch in a separate bowl. Once the mango mix is ready, pour only half of mix bit by bit into the yolks whilst constantly stirring. Then pour the egg mixture back into the pot with the rest of the mango mix. Return to heat and stir constantly with a whisk until it thickens. Remove from heat then stir butter through. Spoon the filling into each tart pan and bake for 20 mins at 180oC until the filling is set and the tart shell is slightly browned. Remove from oven, let cool a little then remove from shell tins and cool further. Whilst the tarts are cooling, make the meringue by whipping the egg whites until it is foamy. Add sugar whilst constantly whisking, add the rest of the ingredients and whisk until it stands at hard peak. 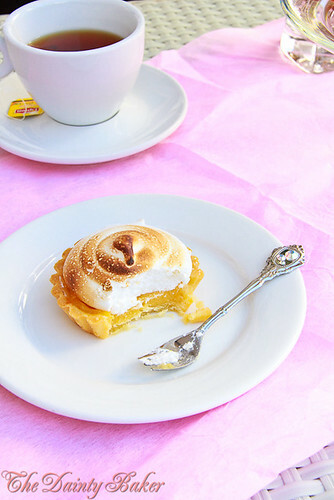 Put meringue into a piping bag and only when the tarts are completely cooled pipe swirls onto each tart. Place these tarts back in the oven at 150oC for another 10-15 mins until the meringues are baked but not dried out. 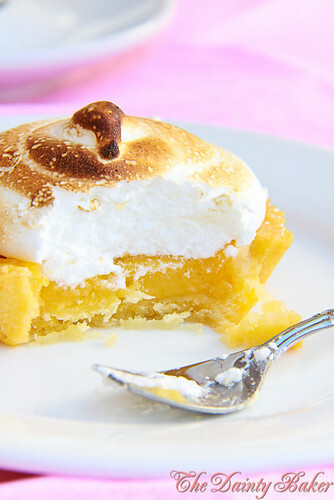 The meringue should be stiff but be soft and fluffy. 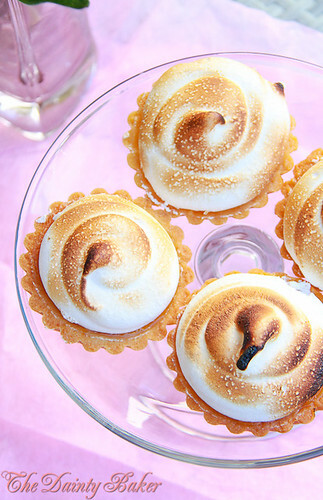 Use a blow torch to brown the tops of the meringue. I guess my choice was probably also influenced because we were doing 'Classical Cakes and Tarts' at school at the time. I learnt that 'fonçage' is the fancy French term to describe lining of a tart pan. I was a little disappointed with this recipe, simply because the mango flavour was ousted by the lemonyness and it was a little on the sweet side. My thoughts at the time was, yes the mango will be a little sweet especially paired up the meringue, but if I use more lemon juice then that should bring up the acidity. To my dissappointment, too much I think. Next time, I will reduce the mango down further, decrease the sugar content (use only 1/4 sugar) and therefore the need for lemon juice. However, this being said, it was still really nice tasting. Sweet, with a tart aftertaste and a hint of mango. ps. 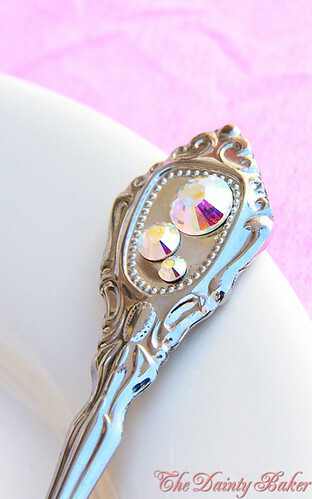 Isnt my little fork too cute?! Got it in Japan. I ♥ Japan!! very cute, and they look very delicious. Words fail me! The only one I can come up with (which falls fa short of these beautiful tartlettes) is YUM! I adore mangoes and this recipe looks delicious. 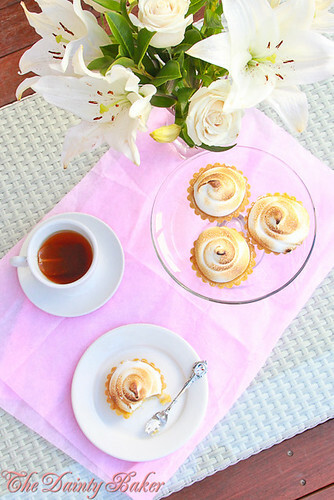 The tarts are so elegant and summery! They look so yummy. Crisp on the outside and gooey on the inside? I know its breakfast time but I cant help but fantisise!